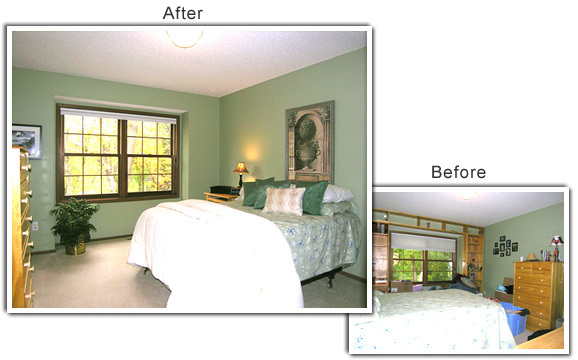 Project: A bedroom in Eden Prairie. Positives: New neutral carpeting, a good view and a large closet. Negatives: An overcrowded bookcase and green walls. This secondary bedroom felt too small, too green and a little chaotic. And the bookcase surrounding the double windows took up too much space. "Anytime you have an attached element in a room that you don't plan to leave behind, you should always remove it before your house goes on the market," said Lori Matzke of Centerstagehome.com. Here's what Matzke did to create a more spacious floor plan and downplay the green walls. Because the owners planned to move the bookcase to their new home, they removed it before putting the house on the market. This opened up space and made the windows, a positive selling point, more prominent. The room gained an extra foot of space along the far wall, resulting in a more open feeling. The bed is now arranged to greet potential buyers, rather than block them from entering the room. This placement lets you see around the bed and creates the illusion of a much larger space. A creamy white comforter and silky teal and linen throw pillows add a soft look. The light oak dresser and dark green walls created a negative contrast. So Matzke moved the dresser to the opposite wall to downplay this effect, open up the floor plan and offer a clear view of the windows. Open blinds bring in light. And putting a small lamp on the side table atop a small pile of vintage books makes it feel more appropriate for the space. Bringing artwork from another room to hang over the bed mimics a headboard. And the piece's muted green, gray and taupe colors help downplay the strong green walls and visually balance out the windows. With strong colors on the walls, you want your artwork to blend in, not stand out. A black-and-white photo next to the window frame draws attention to the windows, while a silk fern in a brass container on the floor draws attention to the view and helps to soften the sharp angles of the window frame.